The Night SHE Came Home! This ALL NEW CUT combines several HALLOWEEN sequels featuring Laurie Strode into one Complete Sequel Epic from 1978-2002. Using footage from three sequels and the extended cut of HALLOWEEN, the Laurie Strode story has been expanded and remixed into one epic film. The story still picks up directly from the end of HALLOWEEN and concludes Michael Myers’ night of horror, then jumps forward twenty years later as Laurie prepares for his return. A new soundtrack has been created with original tracks by John Carpenter from HALLOWEEN and HALLOWEEN III. Additional scenes of Dr. Loomis from the extended television version of HALLOWEEN have been added as flashbacks. This new cut is designed as a direct sequel to the theatrical version of HALLOWEEN. - DVD cover and label included in DVD-ROM folder. In order to retain the original John Carpenter score, several scenes now contain no sound effects. When possible, some scenes have been re-looped with new sound effects. The JOHN CARPENTER REMIX SOUNDTRACK is designed to give the sequel the same sound and feel as the original film, reprising several musical cues. The ORIGINAL “MR. SANDMAN” PURIST SOUNDTRACK is for those who do prefer the original music by John Carpenter, Alan Howarth, John Ottman and Danny Lux. There are a few continunity issues when trying to speed up a few kills. Some hospital characters appear, then dissappear. They are now killed off screen. Footage from the Extended Television Version from FIFTEEN YEARS EARLIER with Loomis have been added as flashbacks, a la THE GODFATHER PART II. The RESURRECTION scenes with Laurie Strode are now included as a dream sequence. Several character visual flash memory sequences have been layered into the narrative using clips from all HALLOWEEN films. – No more “Mr. Sandman” music opening. Music replaced with music from HALLOWEEN. – Opening recap of HALLOWEEN ending has been shortened. – Loomis now fires 6 shots instead of 7. – Re-edited the shooting of The Shape off the balcony. – Replaced most music cues with original John Carpenter HALLOWEEN music. – Removed old woman screaming at sight of blood. – Removed the first kill of girl in house from HALLOWEEN II. – Removed the kid with razor blade apple. – Removed the Ben Tramer accidently killed in Shape costume sub-plot. – Removed media report mention of Michael Myers being burned up in accident. – Shortened or removed scenes with nurses and staff. – Shortened or removed scenes of Michael walking around Haddonfield. – Added FLASHBACK #2: Loomis visiting Michael in his room. Now scored with music. – Added Dissolve from Michael in room as child to walking on street as The Shape. – Removed Nurse and Boyfriend subplot in the hottub. No “scalding” kill. – Removed the nonsense humor of guard looking around Hospital. – Added HALLOWEEN music to silent walking scenes around Hospital. – Expanded Laurie’s dream to include clips from first film. – Added FLASHBACK #3: Loomis at the Michael Myers meeting Part II. – Added flash frames of Judith Myers from behind Michael’s mask in the first film as he looks over the nurse he just killed. – Jimmy is now killed in the pool of blood by Michael Myers. – Removed scenes of Laurie leaving Hospital and hiding in car. – Shortened the conversation in car with Loomis and Marion Chambers. – Loomis now takes charge quicker — no extra dialogue with Marshall. – As Loomis, Marion and Marshall enter Hospital — Laurie runs to greet them and The Shape springs into attack. – Tightened shots as Marshall is killed by Michael. – Added flash frames of young Michael as Loomis shoots him. – Re-edited entire operating room scene with Michael, Laurie and Loomis. – Added flash frames of Judith Myers from behind the mask as Michael stares at Laurie. – Lauire shoots Michael a third time. – Added clips of Michael’s body being taken to morgue as Laurie’s ambulance drives away. – Added surprise sting of Michael in the morgue. – Added “Twenty Years Later” title card. – Removed “Mr. Sandman” from opening of H20. – Tightened shots with Marion Chambers and the hockey kids. – More John Carpenter music added, including cue from HALLOWEEN III. – Re-edited scenes from RESURRECTION, now features a voice-over from Loomis speaking about the dangers of Michael — ending on Laurie locked in her room. – Removed the false scare of the guard and patient. Now Michael kills guard quicker. – Shortened the scene on roof between Laurie and Michael. – Added flashback clips from first film as Michael stabs Laurie in the back. – Removed Laurie’s Dream from H20 opening. – Laurie wakes up from RESURRECTION dream screaming (all the asylum was a dream). – Trimmed John’s friends and L.L. Cool J’s character from story. Now they are just bait. – Removed John’s goofy faces in classroom. – Removed most of John and Molly’s romance subplot. – Shortened scene between Laurie and Norma. – Removed several lines of dialogue between Laurie and Will. – Removed and tightened scenes with Sarah and Charlie. – Tightened argument in car with Laurie and Molly. 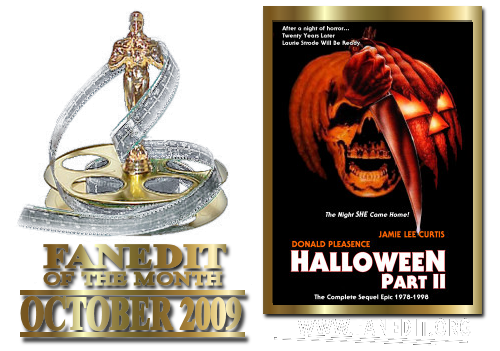 – Added flash clips from all films over final scene with Laurie and Michael. – Final scene is now FINAL. Off with his head. This was enjoyable, but fairly forgettable. It couldn't help but feel like 2 movies pasted together, instead of being a "Complete Sequel Epic".